The Spring Girls is a modern day retelling of Little Women. I went into this novel open minded because I read a few reviews beforehand that said it strayed pretty far from the original story. I honestly really liked this version, and I think that was because I was okay with the fact that it was a bit different from the original. I really loved the setting as well as the characters, and I think Anna Todd did a magnificent job creating a modern version of a beloved classic. I had a little trouble keeping all the characters straight at first, but after I figured out the personality of each girl I was able to really connect with them. I loved that they were all so different and they were facing everyday struggles that young girls face in the world today. It felt extremely raw and relatable, and I really enjoyed those aspects. There were a few times I felt that the novel was a little slow, but it would quickly pick up pace and leave my heart racing. 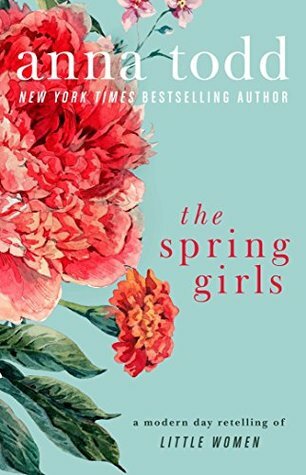 All in all, The Spring Girls was a charming and fun read that I thoroughly enjoyed. I would highly recommend this to readers who enjoy women's fiction. It is definitely different from the classic Little Women tale, but absolutely still worth the read. Thank you so much to Gallery and NetGalley for sending a copy of the novel in exchange for an honest review.